Natural Lycopene is a powerful antioxidant Carotenoid and the pigment that gives tomatoes, watermelon and pink grapefruit their characteristic red color. Clinical studies have indicated that natural Lycopene works through a number of mechanisms to support cardiovascular health and immune function. In addition, epidemiological studies have determined that Lycopene may be particularly important for the support of prostate health, as well as for the health of the digestive tract. 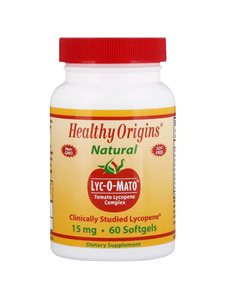 Healthy Origins Lyc-O-Mato is an all-natural standardized extract of red, ripe tomatoes. It contains a full spectrum of tomato carotenoids and other antioxidants. The synergy of these powerful phytonutrients results in greater health benefits for you. As a dietary supplement, take two Softgel daily with meals. A. Lycopene isn’t just one of the most popular members of the Carotenoid family; it’s also one of the most beneficial. Red in color, Lycopene is what essentially gives tomatoes their rich, ruby appearance, though it’s also found in watermelon, papaya, and pink grapefruit. Lycopene is primarily stored in the lungs and prostate, and has been shown to offer a wide range of health benefits, including cardiovascular support and fertility. Most impressive, Lycopene has been shown in a number of studies to eliminate one of the most damaging of all known free radicals - singlet oxygen radicals. These highly reactive byproducts of oxidation are formed during the metabolism of polyunsaturated acids and can be devastating to healthy cell membranes. I love this product. I take it for my blood pressure but my skin looks so much better when I take it. Pure natural supplement for Prostate protection.